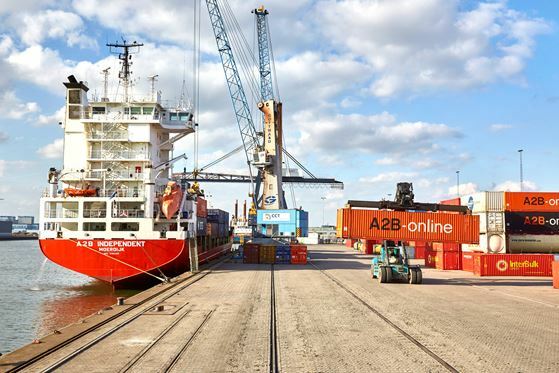 ‘A fantastic add on to our Moerdijk services” says Gerard de Groot managing director of A2B-online. “We are always looking for new opportunities whereby the requirement of our customers and the hinterland connections play a vital role. Both items do apply creating this new short sea service’. ‘The Broekman Distriport terminal is located in the middle of a chemical cluster of companies in the Botlek and as a tri-modal, multipurpose terminal it is ideally suited to cater to the increased demand of multimodality’, according to Rik Pek, Managing Director of Broekman Terminals. ‘Connections with various European destinations such as Norway, Spain and Poland, the availability of a RoRo ramp, quick access to the A15 highways and trains arriving from Italy and Germany make it a strategic hub between deep- and short sea’, he continues, ‘Of course we are very excited about this development and we are very are much looking forward to the cooperation with A2B-online’.